This recipe for mozzarella-stuffed meatballs is easy to make and fun to eat. They are low-carb because no bread or breadcrumbs are used in the meat mixture, and lower in fat becase they are baked instead of fried. Made with a fresh mozzarella cheese filling, the meat mixture is flavored with Italian seasonings, a little garlic powder, and some Parmesan cheese. They make an excellent appetizer or snack, or serve them with your favorite sauce and pasta, or spaghetti squash to keep this meal low carb. If keeping them low carb isn't a consideration, use this recipe mixture for baked meatballs. Just stuff them with mozzarella and bake them following these directions. If you don't eat beef, these baked barbecue chicken meatballs could be the solution. Heat the oven to 350 F. Line a rimmed baking sheet with parchment paper or aluminum foil, or spray with nonstick cooking spray. In a large bowl, combine the ground beef, Parmesan cheese, egg, Italian seasoning, garlic powder, salt, and freshly ground black pepper until thoroughly mixed. Portion the meat into 16 pieces, roughly 1.75 ounces each. Wrap each portion of meat around a piece of mozzarella cheese, sealing it around the cheese while shaping into a ball. A little of the cheese might ooze out as they bake and that's normal, but try to seal them in the meat mixture as well as you can. 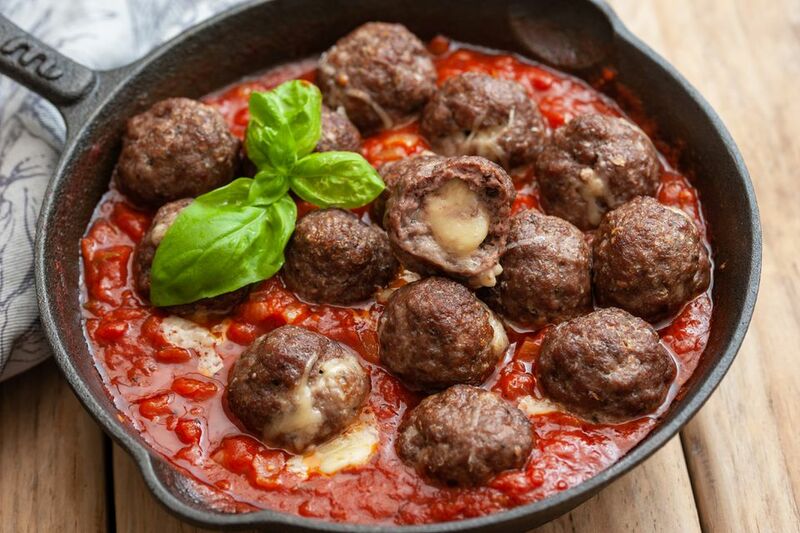 Arrange the meatballs on the prepared baking pan. Bake for 30 to 35 minutes, or until the ground beef is thoroughly cooked. Serve the meatballs with hot marinara sauce or homemade spaghetti sauce. According to foodsafety.gov, ground beef and other ground meats must be cooked to at least 160 F. To ensure they are thoroughly cooked, cut into a meatball to see that no pink remains or use a food thermometer to check the temperature. In place of 1 1/2 pounds ground beef, use 1 pound lean ground beef, 1/4 pound lean ground pork, and 1/4 pound ground veal. Cooked meatballs freeze and reheat well so make a double batch and follow these steps for storing the second batch. Form and cook the meatballs completely. Place them on a parchment-lined rimmed sheet pan and quick-freeze uncovered for two to three hours. When they are frozen solid, transfer them to a zip-top freezer bag and freeze for up to two months. To reheat, thaw them in the refrigerator in the bag you froze them in. Pat dry each meatball with a paper towel and then reheat in sauce. Alternatively, drop frozen meatballs into a saucepan of simmering sauce. The problem with this method is that the water given off by the ice particles could thin out your sauce.